A small flower design done with two different pen sizes – an 0.8 fineliner that I unfortunately lost and for the finer lines I used a Staedtler Triplus Fineliner Black 0.3mm . 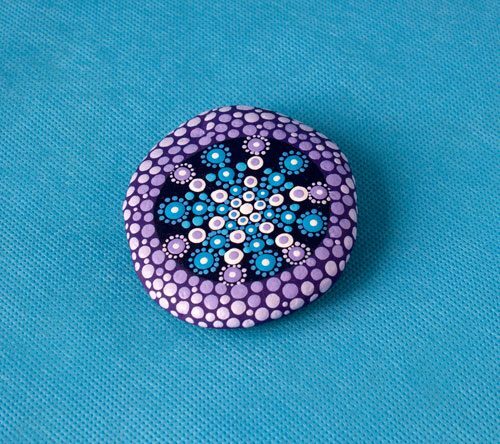 A floral zentangle design for coloring. 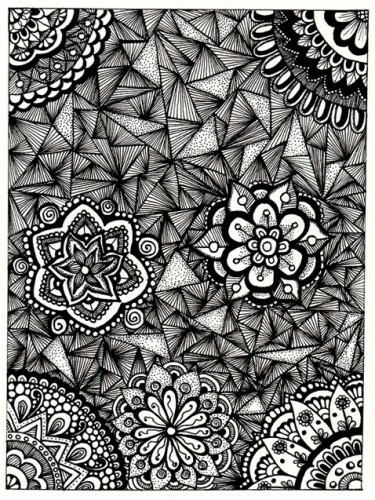 This one is very intricate and it would be best if you color it with well sharpened color pencils or color fineliners. For this particular picture I used Staedtler Triplus Fineliner Pens . When I color in with pencils I use the Koh-I-Noor brand because the colors are really vibrant. You can download the coloring page in pdf format here. 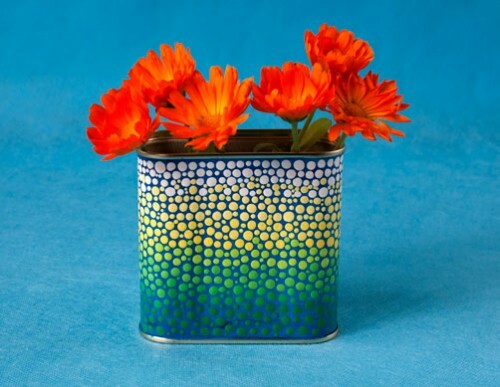 Instead of throwing out this tin, I turned it into a lovely vase using acrylic paints. I had to apply several coats of paint for the background in order to cover all the pictures and labels. Just make sure the paint has dried completely before applying the next layer. (Acrylic paints do dry quickly, but it’s better to have some patience because with such smooth surfaces the paint could come off when you start applying the next layer.) 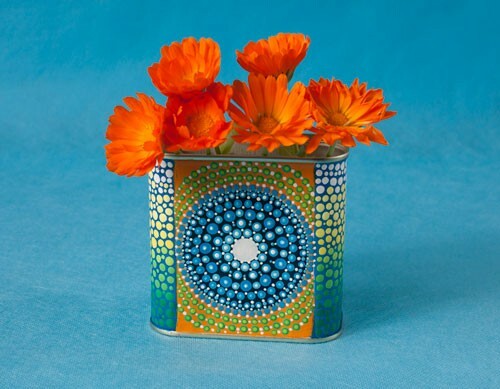 If you use lighter colors – like the yellow I used around the mandala – the pictures and writing on the tin might still come through. Therefore I put the dot arcs and they covered it completely. On the back I just painted dots starting with white and finishing with dark green for a gradient effect. After the paint dried completely (I left it for a couple of days) I sprayed the vase with an acrylic finish spray. 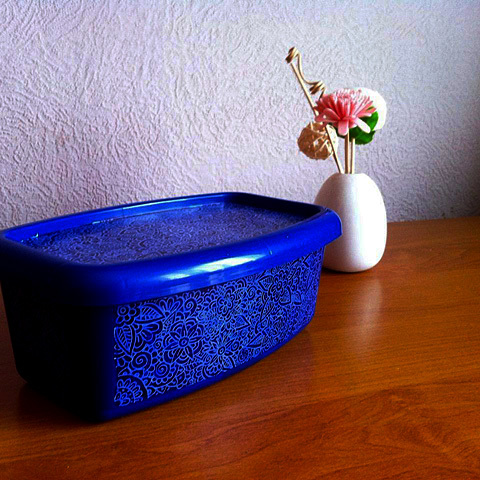 A great way to recycle old plastic containers. I took this ice-cream box, painted over the labels with acrylic paints and then doodled with a paint marker . Now I have a nice new box for my fine-liner pens. 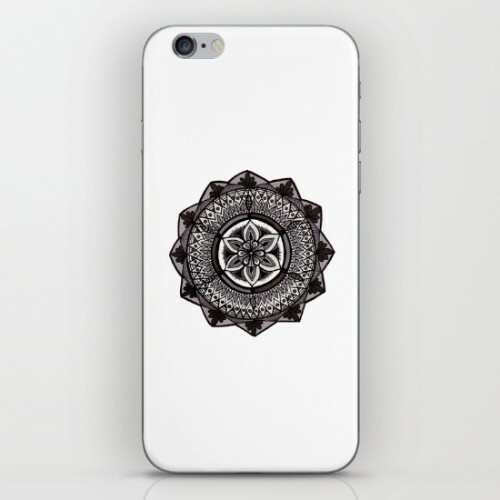 Phone skins with my Shades of Grey Mandala are now available in my Society6 shop. A small improvised doodle filmed with my phone. As usual I used a Faber-Castell PITT Artist Pen size S.
Zentangle Border Pattern #5 done with Faber-Castell PITT artist pen S and Faber-Castell Ecco Pigment 0.1. 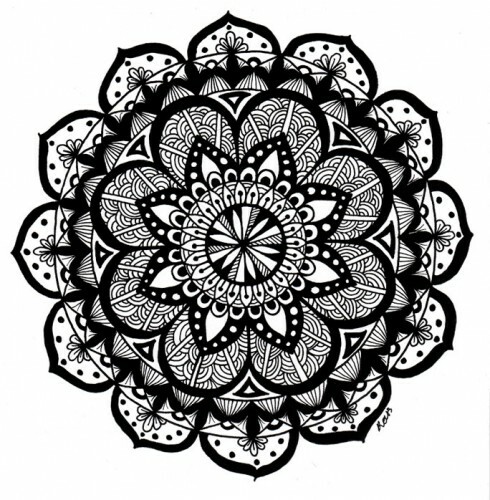 A black-and-white mandala for Inktober. A full page tangle from my art journal that took a while to finish, but it turned out nice and was fun to do. It was a good piece for Inktober since I spent several days drawing it and practicing the repetitive triangular shapes and straight lines. It is very relaxing to do repetitive shapes and as usual I used Faber-Castell pens of various tip sizes.